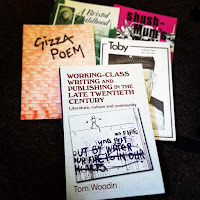 I've always been a fan of lifelong learning, and recently being able to spend an hour, immersed in the stories and ideas that surround the topic of "working class writing and publishing in the late twentieth century" (there's even a book published about it! ), I was reminded that learning for its own sake can be of as much value as gaining knowledge and skills needed for an exam or particular workplace task. Learning doesn't have to be tied to pre-set outcomes, qualifications, or career progression, to create enjoyment and further our understanding of, and thinking about, the wider world around us. Historically, adult learning would be only available in such formats: guest lectures at reading rooms and museums, but today technology widens their accessibility through webinars, podcasts, and the like. But in making such opportunities more accessible to all, I wonder if we haven't lost something along the way - being in a room reduced the distractions to my being able to retain interest and focus on the subject matter. Physically sharing the experience with a roomful of other 'real' people (rather than avatars) re-enforced the value of being there by being part of such a tangible peer community. Needing to invest time to travel to the venue (the impressive and under-recognised Working Class Movement Library) made it more of an occasion - further adding to the experience and my subsequently being a in a head-space that made it far more enjoyable than listening in on a pair of headphones... And the fact that there was tea served afterwards for us all to further reflect on the questions the lecture had started to raise within us was halcyon! So next time you see a lunchtime lecture (or similar) advertised anywhere, and you the subject matter briefly piques your interest - I'd urge you to make every effort you can to get to it.